Like the rest of the Catholic world, the Grand Duchy observed All Souls' Day on Saturday. Usually taking place a day after All Saints' Day, it is a day of commemoration for all the faithful departed. In such spirit, a mass was celebrated at the Cathédrale Notre-Dame de Luxembourg on Saturday morning to remember the deceased members of the Grand Ducal Family, many of which are laid to rest at the cathedral's crypt. 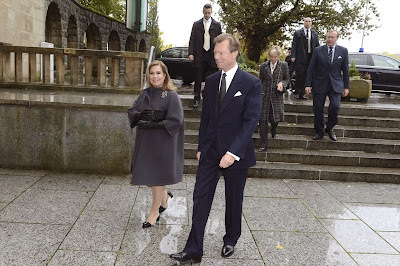 Though unfortunately without any visual evidence so far, the mass was attended by Grand Duke Henri, Grand Duchess Maria Teresa, Archduchess Marie-Astrid and Prince Jean. I realise this is completely off topic but whose portrait is that in the background? It is Grand Duchess Charlotte in 1936.